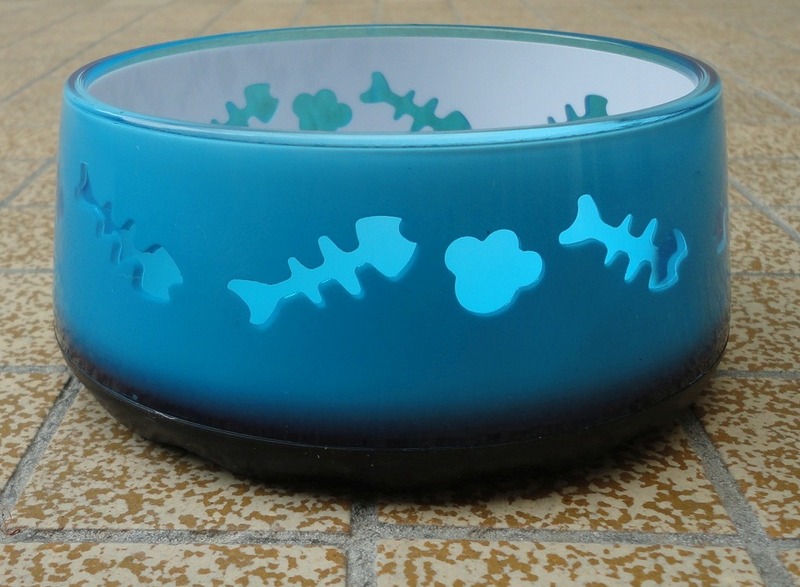 This has to be one of the prettiest pet bowls I've ever seen. I was sent the small size; you can tell by the fish spine cut-out design, suggesting that it is for a cat, while the medium has a pattern of doggie bones. 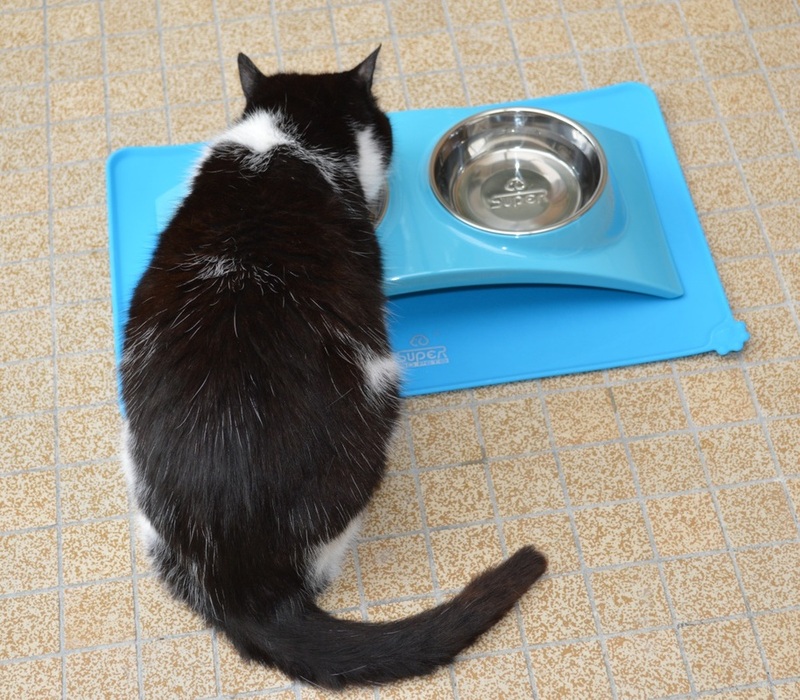 This very flat feeding bowl is perfect for wet cat food as it takes exactly the contents of a pouch. The wide footprint and rubbery feet keep it anchored to the floor or, in my case, the silicone mat, so even a careless eater cannot upturn it. Also the small ribs built into the bottom stop the mixture from sliding around. I have noticed that my oldest cat is eating more out of this dish; I suppose it's less work for her and she does like to lick the last bit of jelly sauce, which gets trapped on the notches. 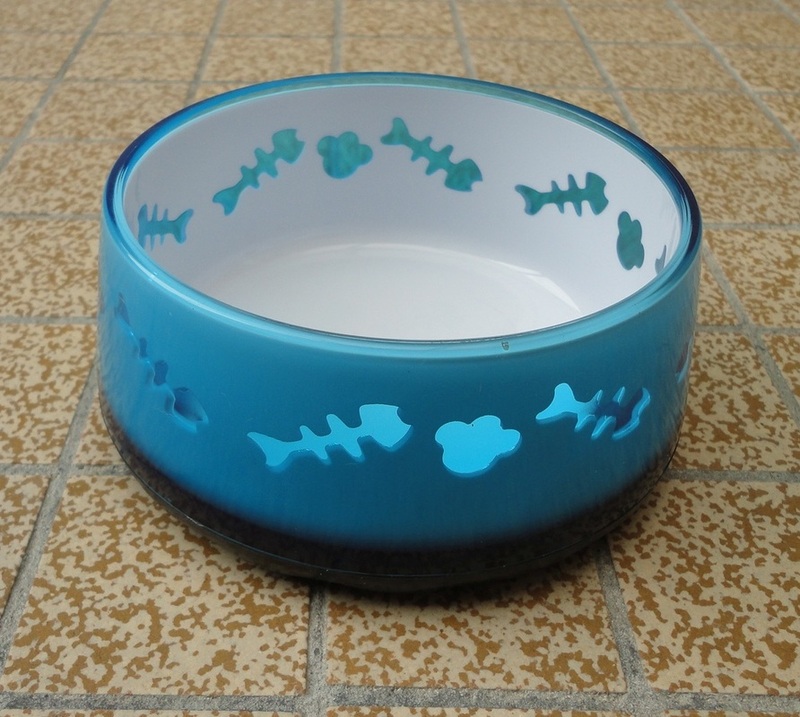 Of course, it works equally well for dry kibble and even water. 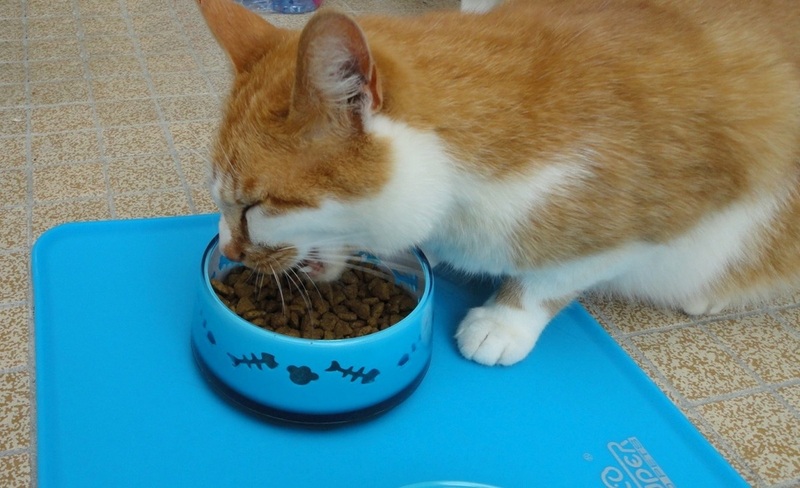 The food-grade melamine is a very good material for pet dishes; it's strong and resistant to breakage (unlike the ceramic dishes it replaces) and washes easily. Out of the pretty colour selection, I chose the Blue (which to me is like a turquoise). There is a little hole in the lip, in case you need to secure the dish to something for added stability. 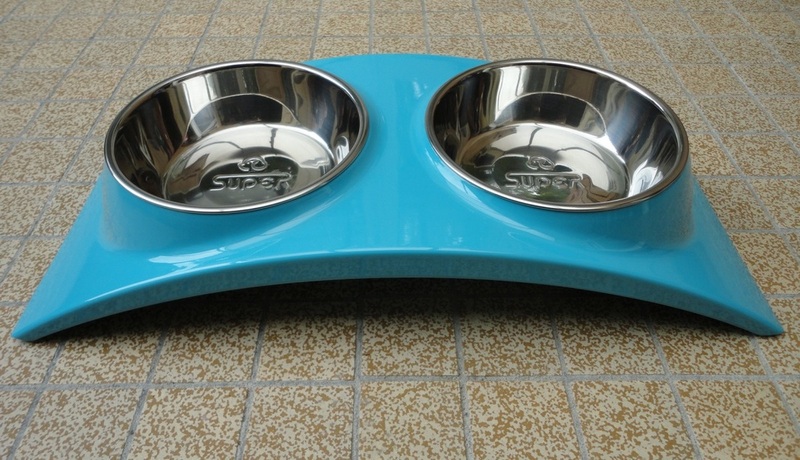 I have the Medium size and it's big enough for two cats to eat side by side, if they don't mind the proximity. It looks like a solid, durable item, a good investment in quality. What a very good idea and so well executed! 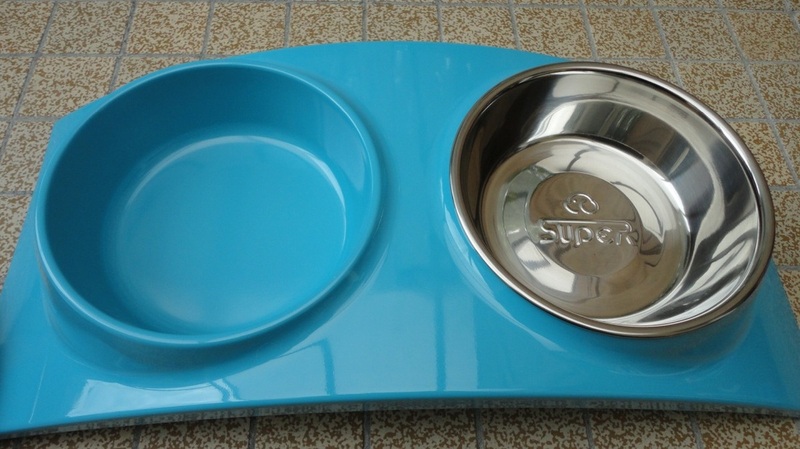 Two superbly hygienic stainless steel feeding bowls set in a pretty melamine arching tray with non-slip pads and available in a rainbow of primary colours. 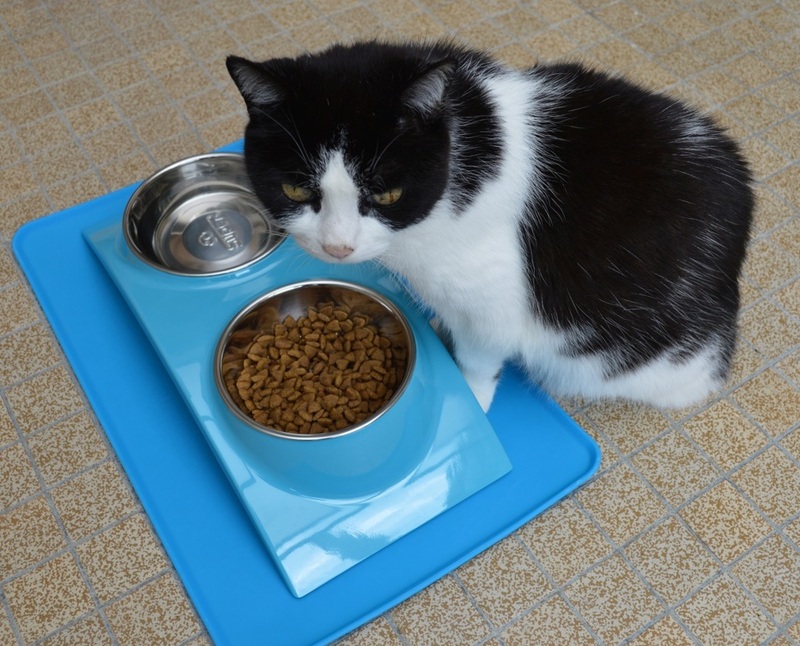 My cats took to their new feeding station with such enthusiasm that I barely had time to take the initial pictures. No coaxing them over with special treats for their photo op moment … they practically pushed me out of their way! The whole unit is a dream to clean, it rinses under the tap and doesn't seem to get dirty. The metal bowls have a lip which makes them easily removable for washing and refilling but sit firmly, once back in place. 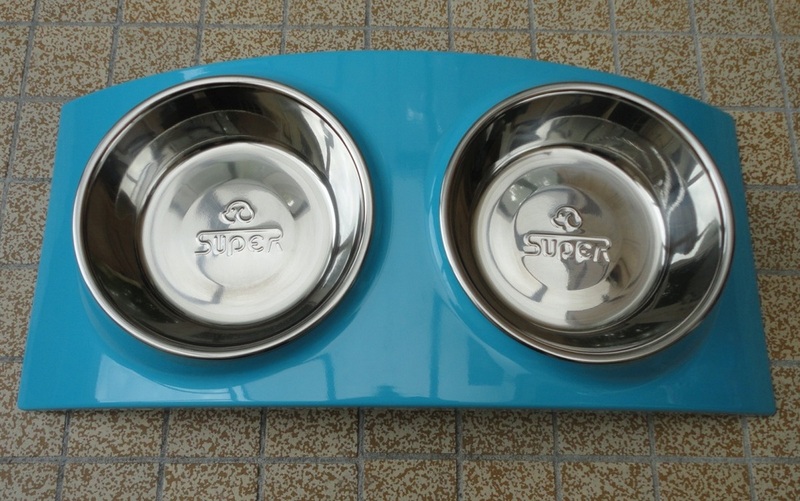 Even if you lose them, the feeder is still usable because of the built-in shapes. 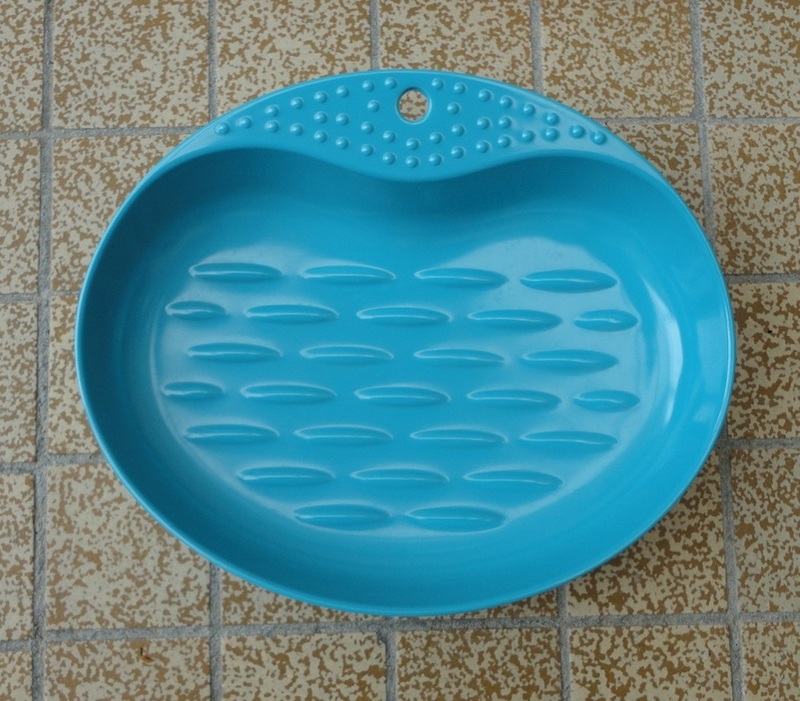 I'm using the bowls for dry crunch and water and have set the unit over the silicone mat by the same brand. I was even able to slide the flat dish under the arc to make a complete all-inclusive buffet table! The colour co-ordination and size match make a pretty combination and it all looks very tidy. My cats hardly spill anything over their new “table”. 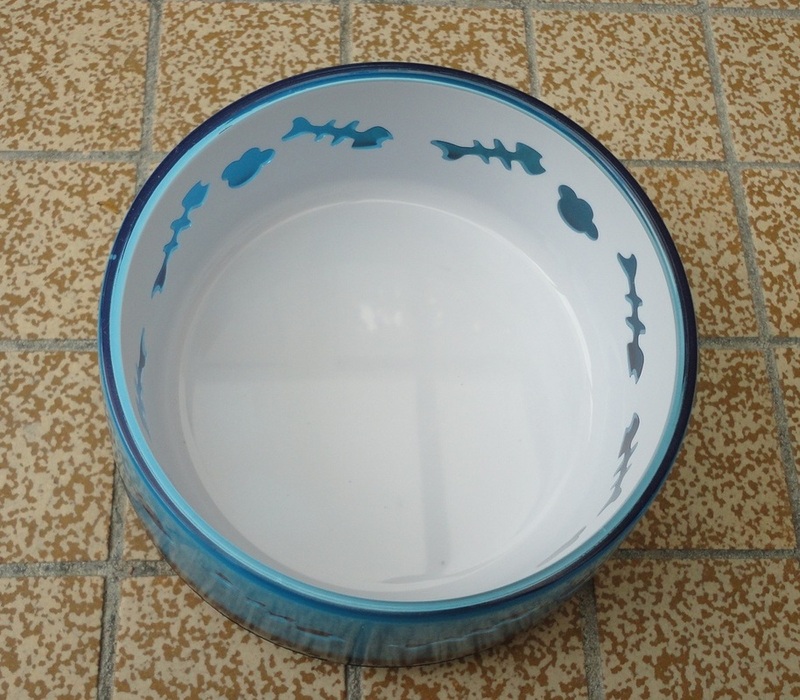 Size-wise, I have the medium and I would say that it is appropriate for cats and smaller dogs. There are larger sizes available, I think. 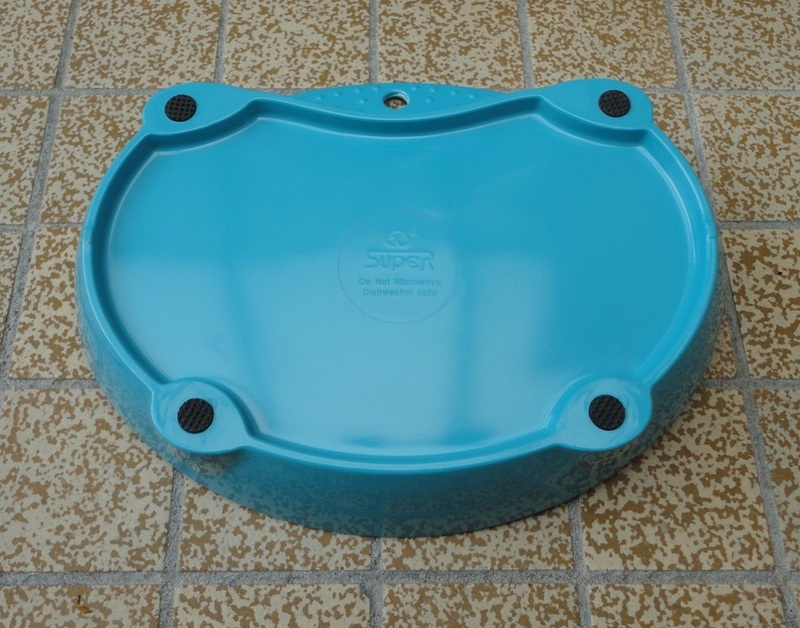 Excellent value for money, as this looks like a very durable product. I'm delighted with it. 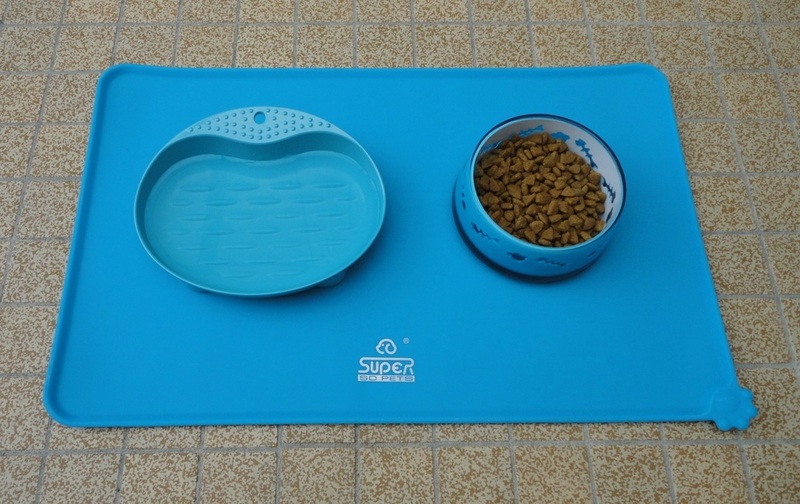 I've used feeding mats for my cats for years, but they were made of different, shiny plastic materials. 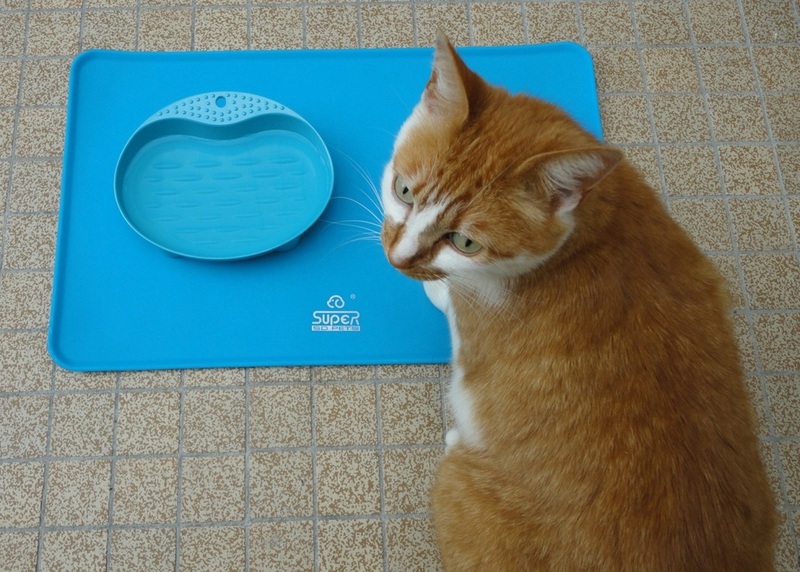 This silicone mat is so much better, it's easy to clean and it keeps the bowls from sliding around. 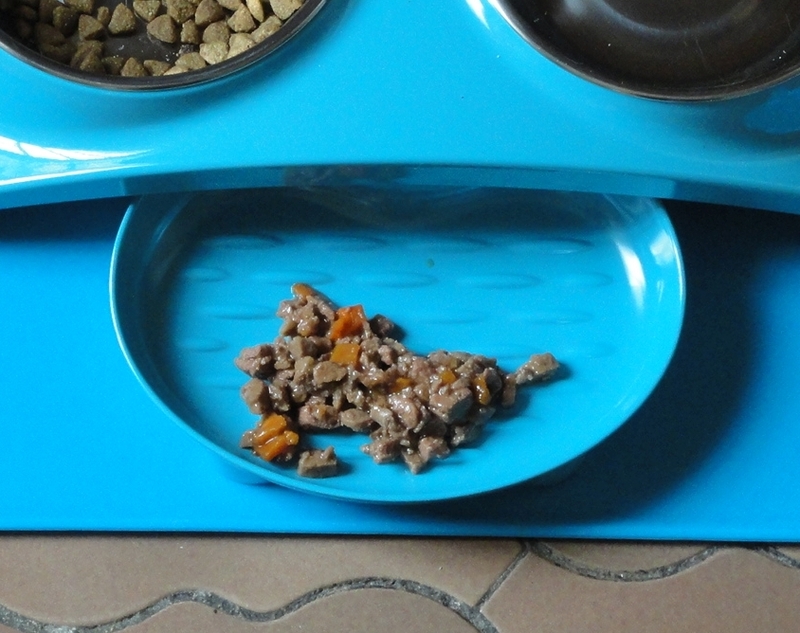 I don't know why but since I started using it, my cats don't seem to spill food much and there is hardly any need to wash it. Their feeding area looks so much neater and they certainly appreciate that. I have placed the double bowl unit over it and there is even room for an additional flat bowl in front, so now there is a fixed place for dry crunch, water and wet food, all in the same contained area. My cats like to share their eating bowls, so the arrangement works perfectly. I also love all the bright, happy colours that can be contrasted or co-ordinated. I chose the turquoise blue, a favourite shade, and my cats seem to agree. They took to their new feeding station immediately, even as I was taking the initial photographs. Perfect! "Fluffy bear is gilt thought"